My search for capybaras in Brazil was less successful in Rio de Janeiro. However, this stunningly beautiful city needs no decorative rodents to accessorize it. And yet, the rumors of urban capybaras were so tantalizing! The lagoa, looking across toward the canal connecting to the Atlantic. Those buildings in the distance have a view of Ipanema Beach. In Rio, there is a lagoon, Lagoa Rodrigo de Freitas where capybaras have been sighted. Lots of water, lots of grass, and quite a bit of habitat in town. The main part of Rio is beyond those mountains. We drove the perimeter (not as easy as it sounds) and stopped at a park with likely looking capybara habitat. Capybaras in the wild have pelleted poop, like deer…or giant guinea pigs! Dobbye’s poop looks like this if I allow it to dry out in the sun, especially if he has been munching on lots of bamboo. Where Sam spotted some capybara poop! This bar looks out over the lagoon where those flat capybaras are staked out. 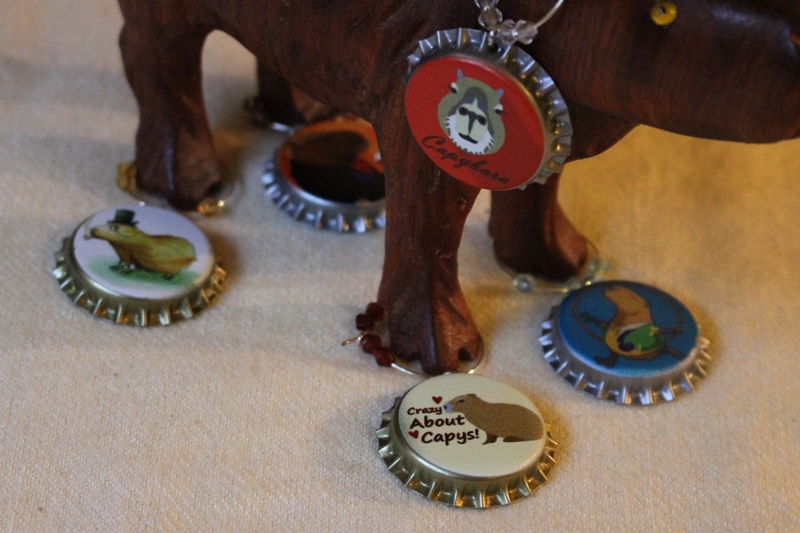 It’s subtle, but there are little capybaras everywhere. I could use a few dozen of these in my yard. How hard could it be to make some of these? So, no, they aren’t real. Real PLYWOOD maybe. We decided to go see some real ones and come back at night. Many people excitedly directed us toward Campo de Santana to see all the capybaras! But they are agoutis. Rabbit sized rodents, we only saw them there. They are more common farther north. In Brazil they are called Cutias! How apt! Agoutis are pretty cute, too. Only the back half of them gets pouffy, which makes them look really silly. The park workers feed them corn. But you came here to see capybaras, so here you go! Busted! This is the zoo! Actually it is a free area just outside the zoo, Fauna Footbridge. The animals are below as you walk through the area. It’s a nice big area, but could use some planting. Only half of it is open and in use, so it is a Work in Progress. We’ve got plenty of those here, too. The capybara (Hydrochoerus hydrochaeris) is the largest of all rodents, reaching a meter in length [39″]. It has no tail and the ears are small. It lives by the riverside, swimming and diving. The capybara is herbivorous and feeds on a wide variety of vegetables. The gestation period is 120 days, and the cubs are born weighing 1.4 kg [3 pounds]. They can have up to seven pups. Brazil has other rodents such as the Agouti (Dasyprocta leporina) at 50 cm [20″] length with brown to reddish brown color. The Brazilian Squirrel (Sciureus aestuans) with a long and hairy tail, arboreal, clinging to the branches with their long nails. The Hedgehog (Sphygurus villosus) is 60 cm [24″] long with yellowish brown fur where they hide the spines which are their defense. These animals are often confused with another relative and the European “porcupine” which also belongs to another family of rodents that are of much larger size. They were in with a couple tapirs, some larger hoofstock, turtles, ostriches and everyone was milling around contentedly. They are all hairier than Dobbye. Their sparse, coarse fur provides no warmth, just protection from the sun. Dobbye would love that warm water. I know you were hoping for more capybaras, so just look at these guys again and pretend they’re different ones. Let’s go back to that bar by the lagoon. There was a cool breeze so they brought out shawls for everyone. Still no LIVE capybaras, but Capycoppy was happy with this one. Rio looks pretty from any angle. This would be the end of the story, but I am already scheming to go back. I’m sure if I get myself back to Rio and sit at this bar long enough I’ll see some real capybaras.